Recently someone interested in the martial arts asked me this now-timeworn question via email. He made mention of a catalogue of styles, almost implying that he should pursue more than one. 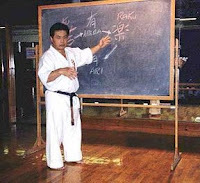 I defined some very broad categories of martial arts: grappling, striking, competitive and so on. But the main idea I wanted to drive home was that he was asking the wrong question. How should I know what style is best suited for this young man? Really, a "style" is a theoretical construct. It's the school that should be the main focus of his query. 1. The reputation of the school. Word-of-mouth is not only the best advertising, but fairly reliable. It's a good place to start. If you seek instruction for your child, talk to the parents from your community. Even if it's for yourself it behooves you to visit the school in question and watch a class in progress. While you're observing a class, what kind of person do you see in charge? A style is only as good as the instructor who's presenting it. Not only someone who is technically proficient, but one who exudes the characteristics you would expect from a competent teacher: leadership, patience and empathy. A good teacher should be a source of motivation and inspiration. A sensei is one who has gone before on this journey, so (s)he should know what you're in for. In the US, anyone can open a martial arts club, no questions asked. Realize that not everyone is qualified (or should be allowed) to teach. A good school and its attendants should be like a surrogate family. How do these people behave? Would you want them as neighbors? How do the students interact with each other? Personality and even occupation play a factor in how you'll fit in at a particular school. I've noticed that certain styles tend to attract specific classes of people. Intellectual, white-collar and artistic types seem drawn to internal styles such as tai chi and aikido. The young guys love MMA. The blue collar working class gravitate towards karate and kempo styles. Of course these are sweeping generalizations based on my observations. Avoid schools that offer contracts. You never know how things will work out, and once you put your signature on something it can be very binding and difficult to get out of. Look for a place that charges by the month. I used to train at a school that had a pay-as-you-go policy (I was paying $4 a class, although that was many years ago). These days corporate schools charge up to $150 per month and expect you to sign for 6 months to a year's worth of lessons. Payments are then automatically withdrawn from your checking account. Welcome to the wonderful world of McDojos. This list is by no means exhaustive. My point is that your school, its attendants and especially your instructor(s) are far more important than whatever style you train in. Visit some schools you may be interested in, and listen to your intuition. Choose wisely. The blue collar working class gravitate towards karate and kempo styles. I completely agree with everything you said in this post. It makes me feel even less about the "Master" I posted about the other day. People should stay far far away from him as he breaks all the "rules" of what makes a good school. I think the best strategy is to find the best teacher that you can and train there. Also look at the students. You'll eventually be just like one of them. I've noticed the tendency to blue-collar/working class in the karate dojo myself. I also notice that once one or two persistent students of a different type stay, the school begins to attract from a wider base. My current school has begun a noticeable upper-middle class/white collar draw - which, since I fall into that line myself, is both unsurprising, and fine with me. I like how you presented this posting. It brings the basics into view, and helps a new aspiring Martial Artist to get a grasp of what he/she is looking for. Great contribution to the arts!! Nerds - in BJJ? That is surprising. Love the picture of Kaicho Nakamura! Picking the right school, especially for parents looking to enroll thier child, is always a difficult task. You should research different styles and find out what schools are in your area. If you find a style that is not as close as you hoped it to be, then find one that might be similar in style and closer to your home.